When most people hear the term dashboard, they probably think about speed dials and other indicators on the control panel of their vehicle. In recent years, data dashboards have gained popularity, and many people see them as similar to those indicators on their car, informing them about the status of a particular function or area of interest. At Gibson, dashboards mean something more. To us, dashboards represent a journey of discovery that ultimately ends in the telling of a story. Sometimes our consulting clients start with a specific question. But oftentimes they rely on us to identify the relevant questions that their data is begging to answer. For example, many of our projects involve looking at the operational efficiencies of different functions within a school district. The school district may know that they need to look deeper into a particular function, but may be unsure of the specific questions that they need to answer. Oftentimes, they rely on us to generate those questions. They want to know what’s going on. They want us to identify the story in their data. Granted, when working on projects for our consulting clients, the overall project reveals many different stories or subplots of the larger narrative. In this post, we provide an example of only one potential subplot. When it comes to analysis using dashboards, we are telling a story visually. But this visual storytelling process usually starts with something data-driven and non-visual. For instance, in an analysis of a school district’s custodial function, we might start with different pieces of data, like the summations provided in the image of the Excel file below. 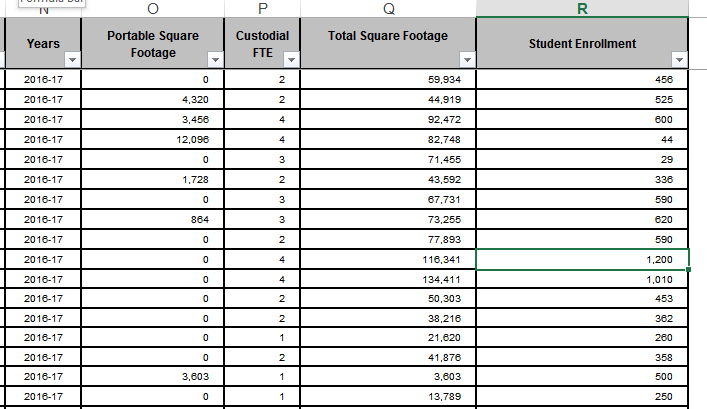 As you can see in this example, we have school years, portable square footage at each site, custodial staff full-time equivalent (FTE) assigned to work at each site, total square footage of each building, and the number of students enrolled at each site. When looking at each of these different pieces, we simply have quantitative representations of different elements present within the school district. We can combine these data in different ways to further abstract them into basic forms ripe for analysis. Like any method of storytelling, there are basic patterns and structures that we use. For instance, in the world of school district custodial efficiency, total square footage cleaned per custodial FTE is a standard performance metric, or you could think of it as a building block for telling the story of a school district. But these kinds of basic forms aren’t enough to tell the visual story. We need to identify ways to arrange the building blocks (i.e., the data in the Excel file above transformed into performance metrics) in juxtaposition, in sequence, etc. to better reveal their patterns and contexts. 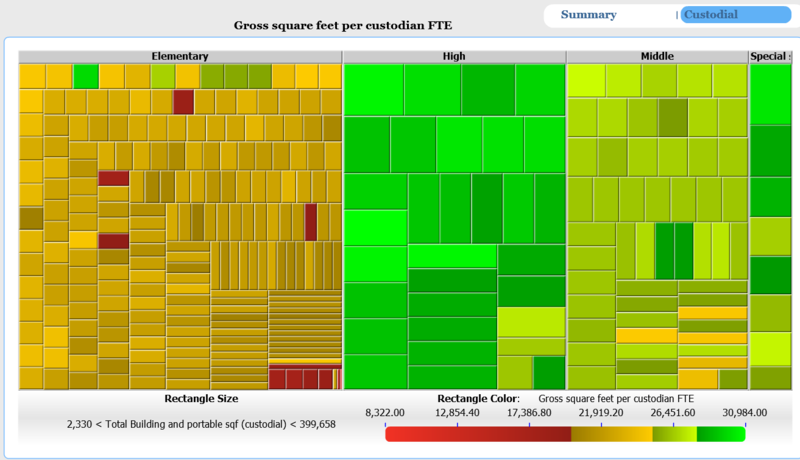 For instance, in the image below, we have visualized total square footage cleaned per custodial FTE as a continuum of colors, red being less efficient according to the industry standard and green being more so. The total square footage for each building is represented by the size of the squares, which allows us to compare similarly sized schools to each other. We have arranged these squares by the dimension of school type, which allows us to quickly analyze them according to that dimension. As you can see, this complex visual arrangement of the basic building blocks turns them into a bird’s-eye view of the relationships between them. The red boxes flag the different elements of the story that the data may have to tell. It’s potentially the Who?, What?, and Where? of the story. We may need to conduct further investigation in order to identify the data as well as the visualization of the data that tells the full story. For instance, when diving deeper into the data of the schools flagged as red boxes, we may find that these schools had a higher percentage of portable building square footage, which could be contributing to the inefficiencies. Because portable buildings are separate from the brick and mortar buildings, they can be harder and more time-consuming to clean. At this point, we may feel like we have identified the plot, or at least one of the subplots, that we were tasked with identifying by the district. While visualizing the data may direct us towards these story elements, it is our knowledge of school district functions and our experience with school district data that allows us to identify the inefficiency. We appreciate the ability to demonstrate our expertise, but we always want to communicate the story as best we can. So, we decide that we need another visualization that fully communicates the uncovered story, like the one in the image below. Since, we know that the percentage of portable square footage is where the story lives, we decide to visualize that information. 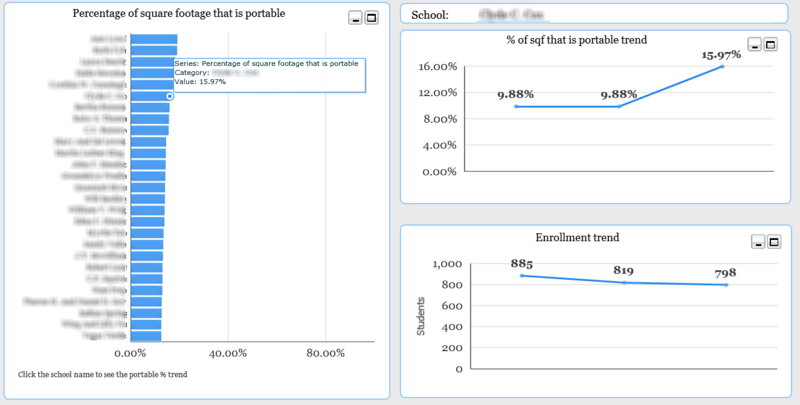 We build an interactive visualization, and when our client hovers over the bars in the bar chart on the left, representing each school from the flagged boxes in the previous visualization, the two graphs on the right display the trends in percentage of portable square footage and enrollment, allowing our clients to explore the narrative of efficiency or inefficiency going on at each of the district’s schools. Because our process uncovers this high-value narrative, we can be proud that our client can quickly see the story they didn’t know they needed to know. For us, dashboards are this entire process of analysis, not just the finished image and interactive application. Dashboards are about telling the most relevant and important stories to our clients in the most efficient and effective manner possible, carrying on a long tradition of visual storytelling, but mixing in the more recent value placed on hard data. You can learn more about our dashboards on our website. If you would like us to identify the story your data is telling, email our dashboard storyteller, Mr. Ali Taylan, at ataylan@gibsoncult.com. Gibson Consulting Group is always looking for qualified individuals who share our passion and mission. Learn more.